Once a separate town and now an inner suburb of Krakow, the Kazimierz quarter was the centre of Jewish religion, culture and learning, and the home of the city's large Jewish population before the war. Badly damaged during the Nazi occupation, with most of the residents either killed or deported to the nearby Holocaust death camps, today it has been rebuilt so visitors can admire the historical architecture and get an experience of what daily Jewish life was once like. Renewed interest in the district was sparked by Steven Spielberg's film Schindler's List which was set in Kazimierz, and the Jewish culture of the area is being enlivened by art galleries, kosher restaurants and numerous cultural events. The Oskar Schindler Factory Museum is itself a popular tourist attraction in Krakow, dedicated to the memory of Schindler and the Jewish workers he managed to save from the death camps; the museum is housed in the actual enamelware factory once owned by Schindler. 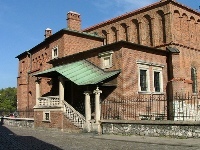 The Old Synagogue is part of the Historical Museum of Krakow, and houses a permanent exhibition titled 'Tradition and Culture of Polish Jews', where the collection of physical memories from the Kazimierz Jewish community is kept. Transport: Tram 3, 9, 11 or 13.